Animation fans and movie goers in Melbourne will be thrilled in September. As an extension of the activities surrounding the 'DreamWorks Animation: The Exhibition', ACMI proudly presents the animation professionals of Australia. 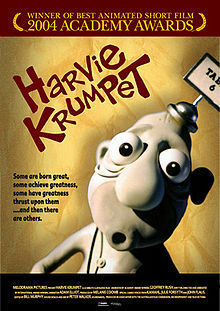 Harvie Krumpet (2003) / Photo courtesy of IMDb.com, Inc.
ACMI will be bringing 5 of the country's top animators together on 15 September for an evening of stories and insightful discussion. The line-up include Oscar® winners Shaun Tan, Adam Elliot, Bruce Petty and nominees Sejong Park and Anthony Lucas, each with his/her own distinctive and unique style. Shaun Tan won the Oscar® in 2011 for the 3D-animated film based on his children's book, 'The Lost Thing'. An expert in the more traditional animation form of clay modelling, Adam Elliot won an Oscar® in 2004 for his short Harvie Krumpet. Bruce Petty is best known for his hand-drawn animation, 'Leisure' where he received Australia's first short animation Oscar® in 1977. Sejong Park completed the Oscar®-nominated 'Birthday Boy' as a student. Anthony Lucas is known for his gothic horror mystery combining different forms of animation which was nominated for an Oscar® in 2006. Don't miss this once-in-a-lifetime evening of animation awesomeness with the country's best animators. Why? Where else can you find the best Australian animators in one place?